HAVE YOU PLAYED A NEW MASON & HAMLIN? Mason & Hamlin pianos are renowned for their elegance, tone, sound, and longevity. If you’re not familiar with our pianos, here are just a few features that set them apart, and why Mason & Hamlin pianos are largely considered to be the Finest In The World. The rim of a piano is the foundation that the rest of the instrument is built upon—that’s why it’s incredibly important to make it as robust and sturdy as possible. At Mason & Hamlin not only do we use Hard Rock Maple to construct all of our pianos’ rims, but we also make them thicker and stronger than any other piano manufacturer. 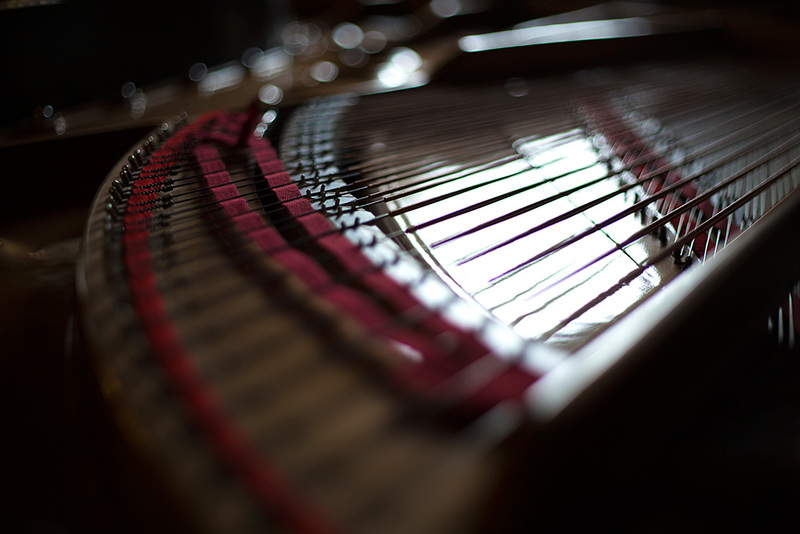 While the rim of a piano creates the foundation, the plate provides it with rigidity. 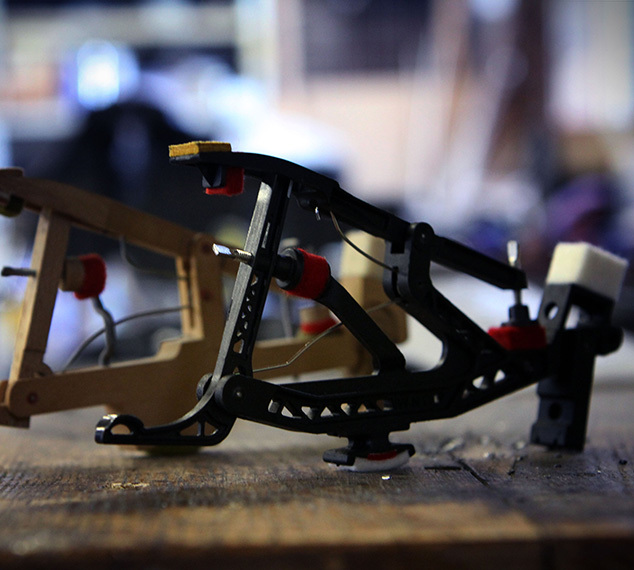 Making a piano as rigid as possible is extremely important since the more rigid the piano, the more stable it will be. This grants the piano more power and tone, as well as making it stay in tune longer. 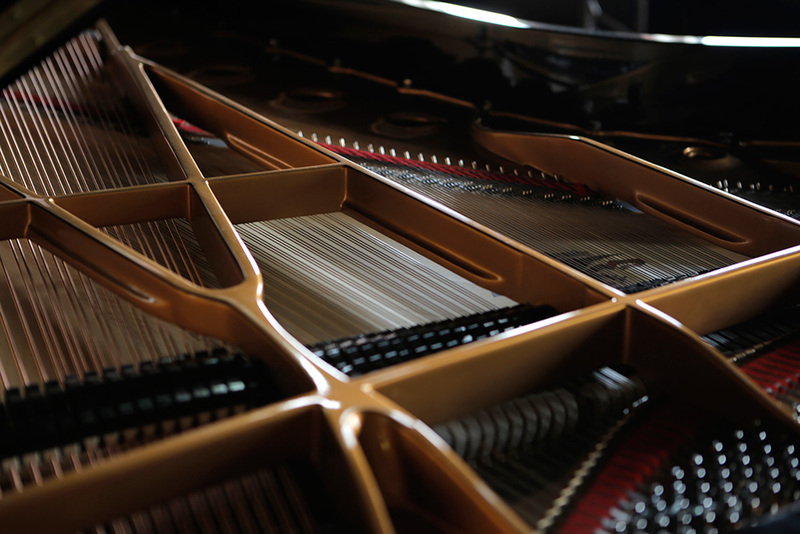 At Mason & Hamlin we recognize the important role that a piano plate plays, so we take a no-compromise approach and use the biggest and thickest full-perimeter plates in the industry across our entire line of pianos. The soundboard is what amplifies and projects the sound produced from the piano’s strings, much like a speaker, and is integral to a piano’s ability to fill a room with sound. At Mason & Hamlin we use Quarter-Sawn Eastern White Spruce—the same tonewood that we used in the Golden Age of the Piano, and renowned for its ability to produce rich, sonorous sound. To support the soundboard, we use Quarter-Sawn Sugar Pine ribs that are cut to the shape of the board, instead of flat ribs that are bent to fit it. This is important and unique to Mason & Hamlin because ribs that are bent to fit the soundboard will always be fighting against it by trying to revert back to their original shape, and putting an unnecessary bind on the soundboard. Once constructed, we taper the edges of the soundboard—this gives it the overall shape and properties of a speaker cone. Much like a speaker cone, the soundboard of a piano must be suspended in place, yet free to move in and out in order to function properly. The Inner Rim of a piano is what houses the soundboard, and unlike almost every other piano company, we cut our rim to fit the soundboard, instead of forcing our soundboard to fit the rim. This ensures that the soundboard can move freely and that there won’t be any binds or “dead spots” in it. The Tension Resonator is one of Mason & Hamlin’s most iconic and innovative features, and comes standard with every Mason & Hamlin piano. This ingenious device is designed to preserve your piano’s tone for decades to come by locking in the original shape of the Inner Rim, thereby keeping crown (slight outward bend) in the soundboard. Without crown, a piano’s soundboard won’t be able to function properly, stifling the piano. 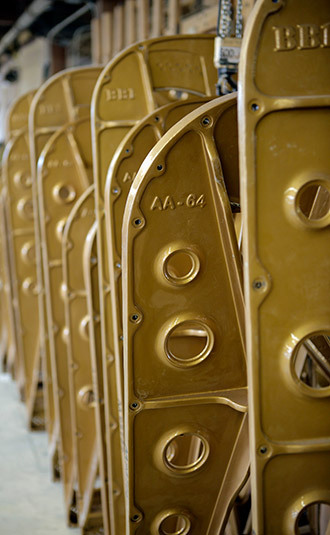 Mason & Hamlin provides the best soundboard protection and preservation in the industry, and as a testament to how effective the Tension Resonator is, rebuilders that have worked on Masons from the early 1900s found that their soundboards still had crown, while most other pianos’ soundboards from the same period had fallen completely flat. A piano’s scale design is based on the size of the piano, and is the blueprint on how long the piano strings will be, where there will go, and how much tension they will be under. A good scale design will give a piano its best possible tonal quality, while a bad one will ultimately hold it back. Most pianos’ scale designs were created in the late 1800s and early 1900s, but it was only as recently as the 1970s that piano manufacturers began using precise mathematical formulas to create them. Since then, Mason & Hamlin has revisited its original scales designs, and is the only company that has updated, recalculated, and reintroduced its older models to give them the best possible tonal quality. 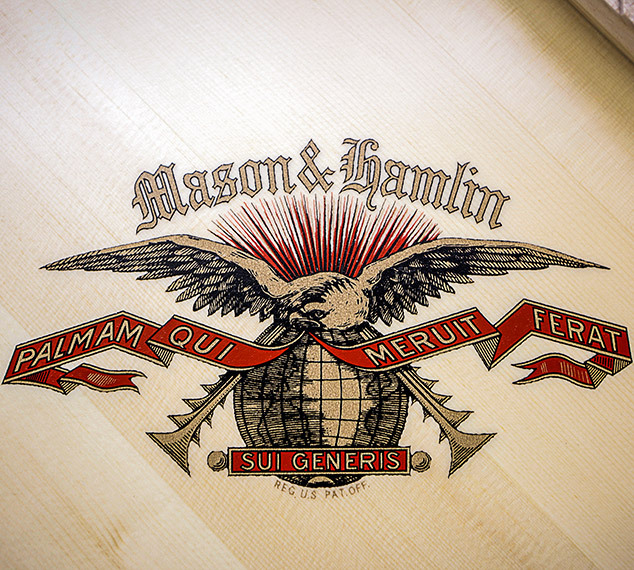 Every new Mason & Hamlin comes standard with a revolutionary WNG composite action. What sets these actions apart from traditional wooden ones? Simply put, water. WNG actions are made with advanced composite materials that are completely unaffected by the water in the air, also known as humidity. Humidity is the enemy of traditional actions, and the best example of how it affects them is how some notes feel harder or easier to play over the seasons. This is due to changes in humidity—when it goes up, the felt in the action will expand and create resistance, making the note more difficult to play. Conversely, when humidity goes down, the dry air will leech moisture from the felt, causing it to shrink and make some notes easier to play than others. Since Wessell, Nickel & Gross doesn’t use felt or other materials that are affected by water in their actions, your piano’s touch and feel will be consistent all year-round. There are many, many more benefits to WNG composite actions that just this! If you’d like more information on why over 160 universities and institutions have chosen WNG actions and how they can benefit you and your piano, please click here to visit their website! 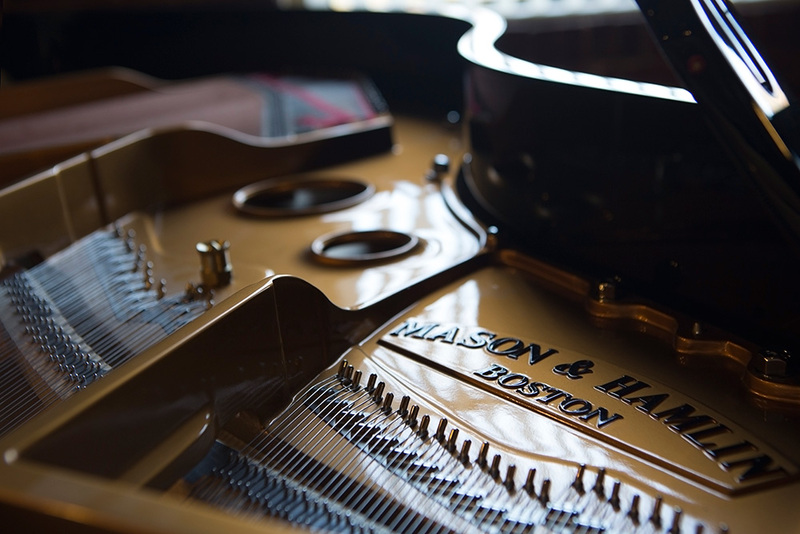 Learn more about and visit the Mason & Hamlin showroom and play our world-class pianos today! Call to schedule a tour or showing today! Interested in buying a piano? Call to our sales department for more information and financing options!